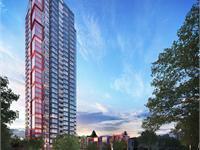 currently under construction at 6658 Dow Avenue, Burnaby. The development is scheduled for completion in 2014. 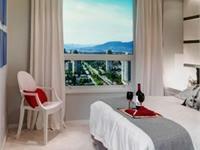 Moda Condos has a total of 256 units. Sizes range from 595 to 899 square feet. 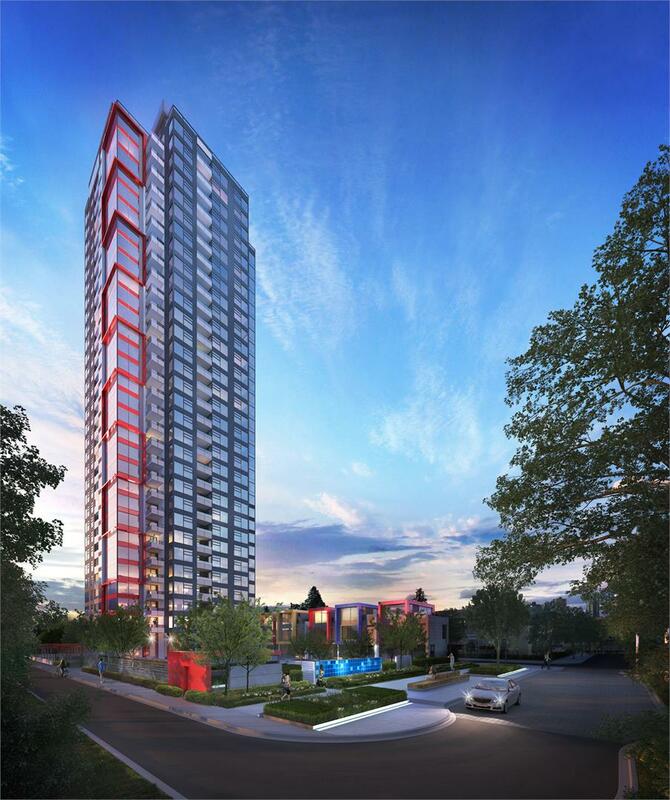 Evoking a sophisticated character that celebrates the spirit of artistic expression and urban diversity, this 32-storey striking landmark redefines the skyline and lifestyle of the most sought-after address in Burnaby. Inside, the one plus den and two bedroom residences feature open-plan layouts, hotel-inspired ensuites and gourmet kitchens with sleek appliances and quartz countertops. Expansive floor-to-ceiling windows allow you to start and finish your day with sweeping panoramas of the city and surrounding parks. Life at Moda will always be in step with the latest fashion and entertainment options. With over 450 brand name stores and services just across the street at Metropolis at Metrotown, your excitement awaits. While strolling home, a newly transformed Beresford Street impresses with friendly sidewalk cafes and intriguing public art installations. And at the centre of the community, a spectacular art wall stands proud by the doorstep of Moda, embodying the animated heartbeat of the city and illuminating inspirations. • The door to your home is substantial and contemporary with richly stained wood and polished chrome hardware. • The carerra-style interior doors are two-paneled and feature European-inspired polished chrome lever handles. • All bedrooms have cut pile carpet, thick and rich underfoot, while living, dining, kitchens, dens and entrances are finished in durable wood-style laminate flooring. • The colour schemes – your choice of New Yorker Night, Milanese Sunset, and Parisian Snow – are understated and form the ideal backdrop for your interior decorations. • Windows are expansive – reaching ceiling height. When the custom-fit vertical blinds on all the windows are open, and the sliding and swing doors pulled ajar, the suite becomes bathed in sunlight. • Windows feature low-E glazing for energy eiciency. • Beyond the sliding or swing doors, balconies are expansive for outdoor living. • Future-friendly technology includes multi-port and Cat-5e wiring. • The kitchen exudes modern elegance with stunning quartz countertops and a large format glass tile backsplash. • Stylish and contemporary flat-panel wood veneer or high gloss white cabinetry is complemented with designer-selected polished chrome pulls to highlight the lower cabinets. - 31 inch wide gas cooktop and self-cleaning wall oven. - 1.5 cu.ft. microwave complete with trim kit. - Energy-eicient integrated dishwasher includes touch controls. • The stylish 15 cu.ft. Fagor® (or Blomberg® in some homes) refrigerator features a bottom-mounted freezer door and is seamlessly integrated into the custom cabinetry. • Seamless under-mounted Faber® hoodfan. • The under-mounted sink in stainless steel simplifies cooking and clean-up. • Sleek recessed lighting below upper cabinets. • Lower cabinets in every home feature a two-bin recycle station. • European-style single lever faucet with telescopic vegetable spray in polished chrome. • Stacking washer and dryer for your convenience. The bathroom and ensuite are rich in design and detail with oversized vanity mirrors and recessed lighting. • Ensuites feature quartz countertops and backsplashes, flat panel wood veneer cabinets with polished chrome pulls, and elongated profile water closets. • Dual-flush water closets reduce water consumption. • European-inspired polished chrome fixtures; most ensuite bathrooms feature full showers and second bathrooms feature tubs. • All showers and tubs are equipped with oversized “rain shower” head on a contemporary straight arm. • The electronic security systems are extensive and include video enterphone at lobby, visitor parkade enterphone, and security cameras in the main residential lobby and elevator area. • A key-fob proximity reader allows discreet and convenient personal access to lobby and elevator, with secondary lobby access for resident parking from both parkade levels. • The bright and well-lit underground residents’ parkade has convenient remote access and emergency assistance buttons for added peace of mind. • The elevator has secure lock-of control access to each floor; residents can only stop on their own floors, the ground floor level and parking floors. • The front door of every suite features deadbolt lock hardware. • New Generation rain screen glazing system for enhanced weather protection and durability. • Fire sprinkler system protects all homes and common areas. • Each home is backed by Travelers Guarantee Company of Canada, with a comprehensive 2/5/10 warranty. • Ceilings up to ten feet in height. • A wireless security system. Your inquiry will be delivered to the developer / builder of Moda Condos, who will send you more information about this development.